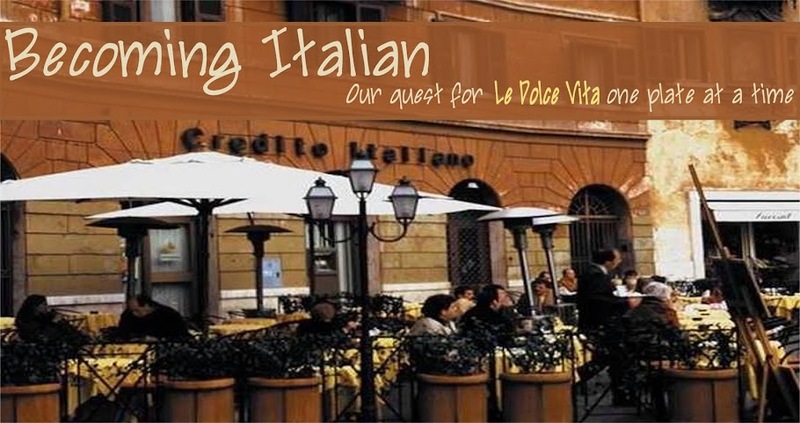 Becoming Italian: From the inside out! Six days ago we put ourselves on a "time to get healthy and drop some pounds" food regimen. (I'm avoiding the D word...don't want to jinx us). A few years ago we did the "You on a Diet" program and loved it! We dropped weight, felt healthy, and loved the food. Why we fell into our old ways again I can't even recall. So this time we are going Mediterranean all the way! Why this way? Let me tell you. I had a horrible visualization of our future. I saw the three of us with our Italian Passports in-hand, walking off the plane in Italy, faces beeming with joy and were not met with the same. Though we were "Italian" we still reeked of "American"...the bad part. In my visualization I heard "tipici americani grassi" from the terminal. Yes, we did everything necessary according to law to become Italian but kept on eating like there was soon to be a shortage of potatoes at McDonalds! So, after shaking myself out of this bad daydream I decided we have to start enjoying the Mediterranean way of eating so when we walk off the plain we are greeted with smiles and "Ciao Bella, benvenuti nella vostra nuova casa" instead! I've been known to spout "Dress for the job you want, not the job you have"...I'm changing that up a bit "Eat for the life you want, not the one you have!"